"We agree that practices such as protesting at the funerals of men and women who died in service to this country and preventing their families from mourning peacefully are reprehensible - a point that President Obama has made for years," the White House said. In response to Westboro, Congress and Obama enacted a law in 2012 restricting protesters' time at, and proximity to, military funerals. 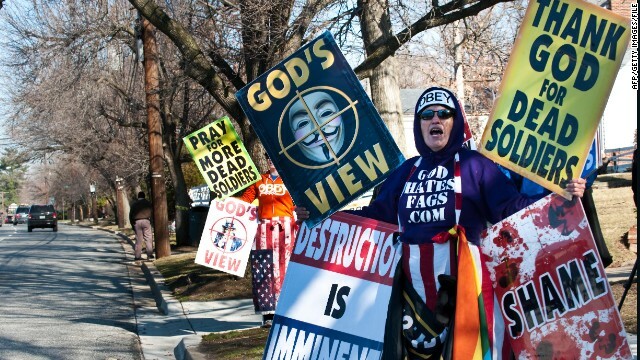 The law followed a 2011 Supreme Court decision upholding Westboro's free speech rights to protest at funerals. Led by its pastor, Fred Phelps, Westboro says soldiers' deaths are part of God's punishment on the United States for "the sin of homosexuality." Members have traveled the country shouting at grieving families at funerals and displaying such signs as "Thank God for dead soldiers," "God blew up the troops" and "AIDS cures fags." Westboro Baptist Church is not affiliated with a broader Baptist denomination. The autonomous church has 50 members, many of whom are members of the Phelps family. The church says they have picketed more than 50,000 events. A GIF map created by the White House highlights the ZIP codes of the people who signed the anti-Westboro petitions. The map shows heavy concentration of signers in Kansas and Connecticut, "two places that have unique insight into the actions of the Westboro Baptist Church," the White House said. The church is based in Topeka, Kansas. As for Connecticut, the Obama administration suggests the anti-Westboro animus stems from the church's threats to protest the funerals of students killed in December's Sandy Hook School shooting. Westboro responded to the petition on social media. "About to swoon with glee! @whitehouse @barackobama telling the world about @WBCSays preachments!" they wrote, adding a picture of the president with horns and the title "AntiChrist Obama." CNN's Bill Mears and Daniel Burke contributed to this report. There is no question that Westboro Baptist Church is a hate group because they discriminate and act in a hateful way towards military personnel. They segregate themselves and act superior to the fighting men and women of the United States. They are irrational and hateful people that have no respect for the community that protects our country and our people. The Westboro Baptist Church should be considered a hate group not only because they are malicious to soldiers and heroes that have fallen, but because the attack the innocent families and friends that are mourning the death of a loved one. A group of "hatefull, misguided, misfits" that should have their tax exempt status revoked immediately! To show up at someone's funeral and completely disrespect it is disgusting! When are WE going to wake up and realize that OUR RIGHTS do have some limits? The more I look into these people the more convinced I am that the leadership at least are just a group of con artists. God: "You have offended me! Here, have my son so that you can kill him so I can forgive you!" Then God the Father & the Son of God will give your soul over to Satan which is called "reprobate"
Jesus Christ, the son of God, knows more about the devil than any human--– The WBC would say they do. LET's Religiosity Law #2 – If you use words and phrases like: "Insert whatever whack-job, derived from a bible verse, comment 'Mona Octavri' just made.” Then you are definitely mentally retarded. @ mona...you do realize that since I don't believe in your mythological jesus, I stand no risk whatsoever of being infected with your fear or psychosis. Keep writing things like you do and you'll manage to make a few more christians doubt their faith, wondering, why god would allow insanity to represent him. As an agnostic, I'd think you'd post that your belief in demons has no reliationship to if there actually are any. Jesus: "So I get back to earth and there are these crosses all over the place and I'm like, W T F! If JFK came back to earth do you think he'd want to see a bunch of assassins with rifles everywhere????" I have always wondered why the implement of an extremly cruel and painful execution is used to represent the churches. I would think a simple statue of Jesus would have been a more appropriate symbol to put on churches. If Adam and Eve didn't know good from evil before eating the fruit, then how did they know that eating the fruit would be bad? The bible never stated that Adam and Eve knew that eating the fruit of knowledge of good and evil was considered bad. They stated that they were told not to or they would surely die. If you consider doing a small amount of research before posting a comment, you might sound a little more intelligent on the subject, despite not having a clue. For god so loved the world that he drowned everyone on it. Lady Gaga came in an egg and called it thinkin'. Pwogwessives are always changing the meaning of words. The Big O came a dreamin' 'bout fathers to compliment his socie mama. The gubmint is just a make-do. If Scientists are "playing god" then wouldn't they be doing NOTHING? If God said, "thou shalt have no other gods before me" isn't he admitting that there are other gods? Shut up Bill. You're nothing but a troll and a Provoker that haunts these boards. No, Bill, there were lots of other gods being worshipped at the time. If 'he' meant something else, such as what you said, a real smart god could have/would have said it. I'm not really a fan of Bill... but aren't you doing the same thing? @ lucifer...no more than you are my friend. Don't be a hypocrite.